When an expanse of concrete countertop makes a statement in a kitchen, bathroom or bar, the edge is what really adds the exclamation point. The shape and texture of the edge helps make the counter look contemporary, traditional, formal, playful or unique. 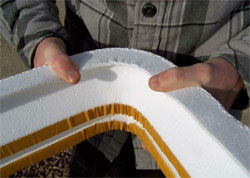 This problem is solved by using forms made of extruded polystyrene foam (EPS). Shapes popular for stone countertops are widely available in EPS. For example, Stegmeier LLC supplies disposable EPS forms in five traditional profiles. Used mostly for cast-in-place counters, they are adhered to the cabinets with double-stick tape and secured by tie wires. Because EPS is more flexible than wood, these forms can be curved to create rounded corners. "You can bend a smooth, tight radius by compressing the foam," marketing director Bud Stegmeier explains. "Three strips of fiberglass tape on the outside of the form keep it from snapping. The inside radius compresses to form a curve, and you have a rounded corner that maintains the profile." Stegmeier also makes EPS forms for backsplashes. Profiling wheels run on standard polishers are usually used with water, which keeps the face cool. If they are used for dry polishing, they should be operated at about 500 rpm to 1,000 rpm to avoid overheating. Using fiberglass tape, a polystyrene foam form can be bent into a curve with a smooth, tight radius that maintains the profile with minimum distortion. This chamfer edge on a surround was cut with a profiling wheel to expose the aggregate and add a decorative accent. Another company supplying EPS forms is PreiTech Corp. This company brought its expertise in thermoforming and extruded plastics and polystyrene foam to the decorative concrete industry in 2005, supplying EPS forms for precast and cast-in-place countertops. Edge forms include precut corners in various angles that "fit on the money with no foam blows," avoiding a problem that can occur when cutting foam, according to company president Michael Eastergard. Their patent-pending design eliminates the need for tie wires. These edge forms are supplied in classical shapes, such as bullnose or French curve. 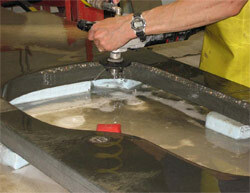 PreiTech also supplies a ledge form that can be used to support reusable urethane rubber molds. "You can use the ledge form to hold a urethane mold in any pattern," Eastergard says. "If you have a box of ledge forms, you have the ability to form any type of countertop edge in a short amount of time." Polyurethane rubber molds in various designs are available from manufacturers of stamping tools for decorative concrete. Popular designs include rock edges, rope details and other repeatable patterns. 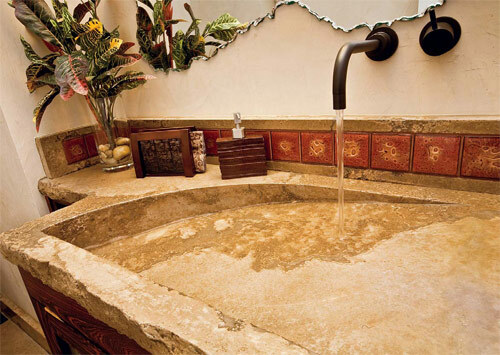 Some contractors use molds for stair risers or swimming pool edges to give shape to countertops. This countertop was cast in a regular rectangular form. The curved indent was created by putting a piece of half round in the form before casting. Concrete artisans often look beyond concrete suppliers for countertop edge inspiration. A rich source is architectural molding. "Concrete countertops don't have to be only modern and contemporary," says Jeffrey Girard, P.E., president of The Concrete Countertop Institute. "You can use moldings to echo in reverse the room's crown molding or cabinet design in concrete to match any style." A simple cove or round molding helps a countertop fit in with traditional décor. A more elaborate edge can be achieved with a detailed molding, such as one with a traditional egg-and-dart motif. Inexpensive standard wood moldings are widely available from home supply stores, according to Girard. When using them, he recommends, seal the wood and make sure the sealer is completely dry before it comes in contact with wet concrete. "Otherwise, moisture will make the wood swell, which can distort the shape and cause cracking or demolding problems," he says. Sealing the wood of the molding will also result in a cleaner release and a smoother surface. Decorative moldings are also available in rigid foam plastic that is already waterproof. These can be placed in the form and used right away without sealing. A form release should be used if the molding is painted, to prevent paint from adhering to the concrete. Girard also uses more flexible moldings made of hard rubber to create classical architectural details. "Concrete countertops don't have to be only modern and contemporary," he says. "You can use moldings to echo in reverse the room's crown molding or cabinet design in concrete." Some of these molding products are not available everywhere. Girard recommends trying home supply stores first and then moving on to specialty trim shops. An Internet search will also yield resources outside a specific locality. The concrete for this counter was cast upside down and pressed into a form with a copper inlay. The edges were formed with a custom plaster mold. This stone edge was achieved using a urethane mold from a decorative concrete supplier. Originally a finish carpenter, Tommy Cook, co-owner and principal artisan at Absolute ConcreteWorks LLC, based in Poulsbo, Wash., is very familiar with these standard architectural moldings. He sometimes takes this idea a step farther by designing custom profiles and arranging for a trim company to cut them to order. For example, a standard 3/4-inch chamfer edge is easy enough to find, but when Cook wanted a quarter-inch molding, he had it custom cut from larger stock material. A trim shop can also set up their routers and jigs to cut a more detailed profile. Cook keeps an eye out for specialty moldings such as roses, trains or flower designs used for chair rails and wainscoting that can be used to create one-of-a-kind countertop edges. "You can use anything that's about 2 inches high (or cut to size) with a relief to get a cool finish, usually for about $2 to $20 per linear foot," he says. Concrete cast against the molding will come out with the pattern in reverse. To get a positive imprint, Cook makes a rubber mold of the architectural molding or other "found" shapes. For example, a customer once brought in a dog whose paw prints she wanted preserved in her kitchen counter. Cook pressed the dog's paws into plaster just before it set to get a distinct print. Then he clear-coated the plaster and filled it with liquid polyurethane rubber. When this cured, he demolded it and attached it to the concrete edge form with double-stick tape (spray adhesive may also be used). Now the paw print pattern runs along the vertical edge of the GFRC countertop. A bevel-profiling wheel was used to cut the angle in this edge and expose the aggregate. A piece of flexible architectural molding was used to create this traditional egg and dart pattern. Cook also uses clay to sculpt custom designs. For example, to get a the look of a chiseled rock edge, he packs a form with clay and then presses broken rocks into it at random. If using oil-based plastiline modeling clay instead of water-based clay, he recommends washing the concrete with lacquer thinner to break the oils down before sealing. One of the more innovative techniques for custom edges on countertops is being practiced and taught at Buddy Rhodes Artisan Concrete. Students there learn to create custom molds in plaster. "We create a screed with a two-dimensional profile," explains Buddy Rhodes Concrete Products CEO Stephen Schatz. "Then we draw it along a rail like the edge of the table or around a radius, and we build up plaster by hand in layers until the whole shape is filled in." The edges of this concrete bar and footrest were shaped using a plaster mold. Another new edge treatment has nothing to do with forms or molds at all. Over the past four or five years, profile wheels for shaping stone have been gaining popularity. These are diamond cutters that run on standard polishers, something akin to a wood router. They are used to shape edges on both cast-in-place and precast countertops. These are typically used for wet grinding, to keep the concrete and the grinder from overheating. "But you have to go dry sometimes, when the countertop is already in place and you can't have water everywhere," Jeff Girard explains. "The challenge with running the profile wheel dry is that the heat of the friction melts the bond holding the diamonds in place. When it comes to bordering walls, pools and other installations, it pays to get edgy. Here are a few fresh options.